Schizostylis plants are hardy perennials that reach about 60 cm in height. They bloom from the end of summer through autumn with cup shaped flowers of red or pink; these are are carried on spikes. Although they are still commonly known as Kaffir Lily in many parts of the world this name is rightfully becoming less used. This is because the word Kaffir is used as a derogatory term for black people in South Africa. We recommend that you refer to the plant as the Crimson Flag Lily when you discuss it to help encourage the use of this friendlier plant name. Height: 24 to 30 inches (60—75 cm). Growing Region: Zones 8 to 10. Flower Details: Crimson red, pink (Schizostylis coccinea has a white cultivar ‘alba’ available. Cup-shaped. Yellow style. Foliage: Semi-evergreen. Linear sword-shaped. Erect. Seeds: Cover. Before the last spring frost. Tuber: 2 inches (5 cm). Spring. Provide a winter mulch to protect the tubers during the first growing season. Sow Inside: Germination time: one to three months. Temperature: 55 to 60°F (13—16°C). Two and a half months in advance. Transplant outdoors following the last frost. Space at 9 to 12 inches (23—30 cm). Requirements and care: Full sunlight or partial shade. Good drainage. Rich, moist soil. Neutral to acidic soil pH. Spring feed. Spring mulch. Couple of further while growing. Divide every three years to maintain vigor. Protect from strong winds. Propagate: by dividing at the start of spring (leave four or five eyes). Miscellaneous: Synonymous with Hesperantha. Schizostylis is Latin for ‘divided style’. 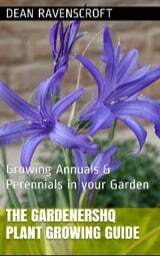 Schizostylis plants can be grown from tubers or seeds. Tubers should be buried at about 5 cm deep in the spring. Seed should be sown before the last frost of spring, and lightly covered with topspoil. They can grow in either sunny or partially shaded conditions and requires an area of the garden that has good drainage. Ideally the soil that the lily grows in will be rich, moist and have a PH that is neutral to slightly acidic. If you plan to start off indoors then start about two or three months in advance (they need to be transplanted just after the last frost of spring). It should take from one to three months for seeds to germinate at a temperature of 12 to 15 degrees centigrade. Once ready transplant outdoors at about 25 to 30 cm apart. Crimson flag lily and other Schizostylis take a little looking after. It is best to grow them in an area that does not receive much wind. If growing from tuber, then supply a mulch in the first winter to protect the plant from cold. In all cases supply a mulch in spring to help keep the soil cool; the lilies should also be fed in the spring, and a further two times whilst growing. 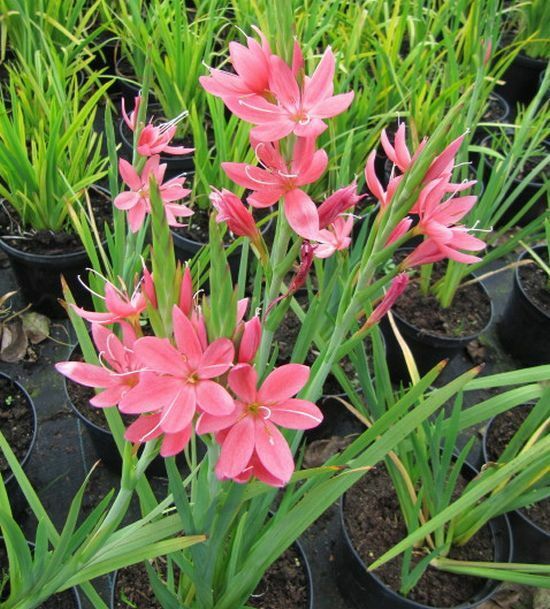 Schizostylis plants likes to grow in a moist soil so keep well watered in dry spells. To maintain vigorous growth divide the plant every three years. If you require more plants then propagate by division in the spring ensuring to leave five eyes.